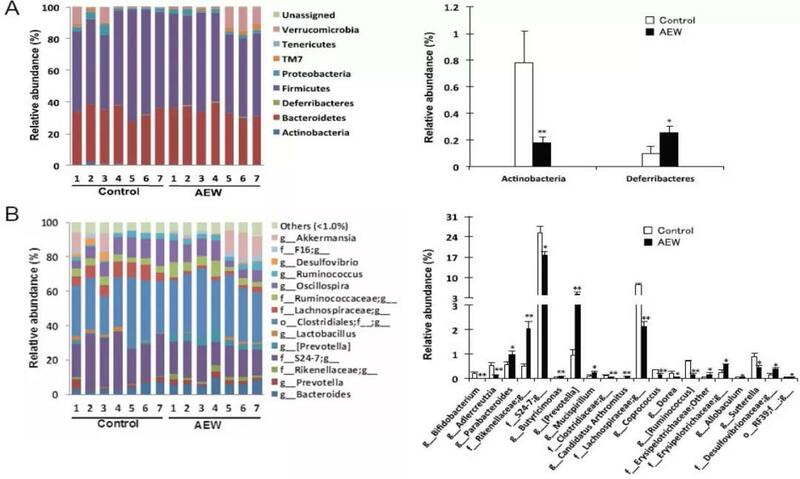 Fig Modulation of molecular hydrogen-dissolved alkaline electrolyzed water (AEW) on the composition of gut microbiota. Note: Phylum level (A) and genus level (B) taxonomic distributions of the microbial communities in the stool samples ascertained from next-generation sequencing. The right graph portrays significantly different taxa. Data represent the means ± SE of seven mice. *P < 0.05, **P < 0.01, vs. control group (Mann-Whitney U test).